This past Shabbat here in Israel (chol hamoed Sukkot) we had a few good downpours of rain, causing us to scramble to get mattresses and the like out of the sukkah before they got soaked. The next day, I spoke to a friend about it, who lamented, "Hashem doesn't want us - He just poured a drink in our face." He was referring to a Mishna in Sukkah (28b) which says that if it rains on Sukkot and we have to leave our sukkahs, it's like when a servant comes to pour his master a drink, and the master - unhappy with the servant - pours the pitcher in the servant's face. I responded to my friend that I wasn't terribly impressed with the middot of this "master". You're not happy with the service, so you pour the drink in the servant's face? If that's not obnoxious behavior, I'm not sure what is! At any rate, it's a far cry from the "perfectly good", "perfectly kind" picture of God which people tend to paint today. Seems to me that in the days of yesteryear, at least as recently as the times of the Mishna, it was okay to have a God who gets cranky and ornery at times, who's a bit more "human". And honestly I'm not sure which choice I prefer - (A) a God who on occasion can be a bit obnoxious but who's more human, more real, or (B) a God who's "only good" but represents a kind of far-removed notion of philosophical perfection which no one can ever hope to attain. My sense is that option (B) is what gets people to believe in ideas such as Chazal could never be wrong, that every Torah luminary who ever lived was a perfect tzaddik, etc. It's living in fantasyland, it's historical revisionism, and it borders on people-worship. On the other hand, I suppose I wouldn't want people walking around in the mindset of option (A) either, pouring water in each other's faces (or far worse) and justifying it as "emulating God". Of course, I don't go for (A) or (B). I don't have a "Master". I do the work because I want to, and if anyone ever threw water in my face, I'd seek employment elsewhere! I recall one Shmini Atzeret a few years back when the first rain of the season fell mamash right after Musaf, right after the prayer for rain. And I remember how elated everyone was, the feeling that this was a positive omen for the Jewish people, that we must have earned Hashem's favor. After all, as soon as we ask for rain it starts coming down in buckets. So it's a great omen when it rains after Mussaf, but if it rains 24 hours earlier, on Sukkot, it's a bad omen... Even though I've seen it time and time again, it never ceases to amaze me how intelligent people can be so naive and superstitious. 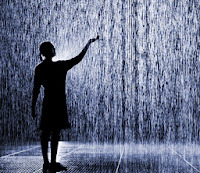 Just take the rain after Musaf - does anyone really suppose that every shul got rain right after Musaf? What about shuls that start davening later? What about other towns where the rain must've fallen an hour or two earlier? What about all the places which got no rain whatsoever? I don't at all knock the joy people experience - goodness knows we need more of it! I'm not saying that we need to walk around like Mr. Spock, being so rational that we intellectualize away our feelings of positivity. But #1, for every warm and fuzzy experience produced by one superstition, there's fear and negativity produced by a different superstition. And #2, if we want to bring ourselves to a mindset of joy and confidence and positivity - then why not just choose a non-superstitious way, of which there are always plenty to choose from. In the past year alone, a close relative of mine became paralyzed. A friend barely 40 years old finished aveilut (mourning) for her husband. Another friend lost a sibling in a devastating car accident. Another has a spouse who fell into a severe clinical depression and can now barely function. We have friends now struggling with an anorexic child, others with an Asperger's child they now have to send overseas to a private school they can't begin to afford, another who got divorced after two decades of marriage and only now is telling people about the hell she went through, another who revealed to me that he's gay and going bananas in his frum married life. I could go on and on. And that's just people I know, in the tiny circle of people in my life. And even in that circle, without a doubt I'm only seeing the outer surface of what's happening in people's lives. I'm sure there are people I see every day who unbeknownst to me are struggling with health problems, marital problems, child-raising woes, financial hardship, family-relational stress, addictions of various types, even abuse. There are people who put up a good show but are completely miserable, can barely get out of bed, are riddled with self-doubt, anxiety, who feel overwhelmed, stuck in their lives with no way out. So aside from the horrors and hardships we actually hear about, there are many others quietly undergoing immense suffering, day in and day out. And the truth is, we all suffer. Every one of us has our struggles, our battles. Life is really, really hard a great deal of the time. The point is this. While I don't believe there's any "objective meaning" to our suffering, nor to anything else for that matter, there is most definitely - and crucially - personal meaning, subjective meaning. And in my opinion, the very first and most important meaning we can derive from suffering, is the fervent desire and commitment to stamp it out, to prevent human suffering - or at the very least work to alleviate it - wherever and whenever possible. In fact we should see that as part of our sacred mission in the world. 1. Helping us to cherish what we have. 2. Helping us to strengthen/deepen our relationships. On point number one... It's simply human nature that sometimes it takes losing something, or nearly losing it, or seeing someone else lose it, to appreciate that thing. You have a health scare, and suddenly you're just happy just to get up in the morning and be able to walk out the door and go about your day, grateful just to look up at the blue sky and take in a deep breath of air. Or you see people whose child has physical or mental problems, or who dies God forbid, and you just want to love and hug and appreciate your own child, look past the difficulties you have with them and just cherish your time together. The same goes with a parent, a spouse, a sibling... You see friends who went from prosperous to broke, having to sell their house and go on financial aid, and you're glad just to be able to live simply - and in fact the desire to live lavishly seems misplaced. On point number two... Like it or not, suffering brings us closer. With every last person I mentioned above, who over the course of the past year has experienced great suffering, it was the time we spent together during and in the wake of that suffering which made us closer, strengthened the bond of our relationship. Hours upon hours on the phone. Visits in the hospital. Inviting them for Shabbos meals. Watching their kids for them. Being there when they needed it, the way they needed it. To go through hard times with someone has a transformative effect on the relationship like little else. It's no question that I wouldn't be as close with many friends and family members were it not for traumatic episodes in our lives that we helped each other through. Again, needless to say I wish none of this suffering had taken place. But I also have to acknowledge that b'dieved (given this foregone reality), there's a great deal that we gain from it in two central aspects of life: enjoying what we have, and forging deeper relationships. 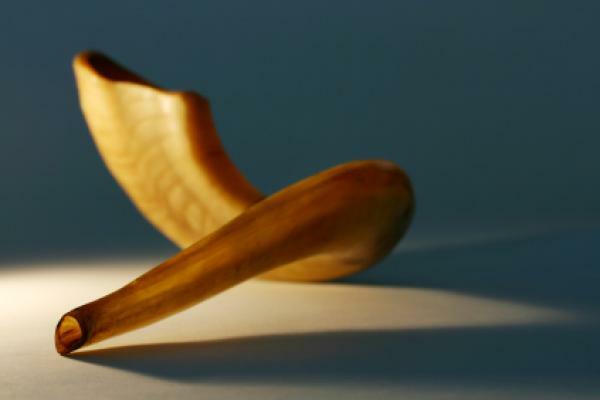 On Rosh Hashana, we talk about the Books of Life and Death being open. (I take this as a metaphor, needless to say.) Which one will we be written in? is the question. We don't know. And when we think about the things that happened to people we know during the year 5773, many of them completely out of the blue, it's pretty darn scary. We don't know what our lives will be like when the year 5775 rolls around - or even (and I'm sorry for being morbid) whether we'll even be here to see it roll around. What this reflection does is help us to appreciate the time that we do have a little bit more. We can try to cherish the people in our lives, the people we love, a little bit more. We can take a little time out to do or see things which are meaningful to us but which we never seem to get around to. We can be there for people who are suffering. Make the call. Stop by. See what they need and be the person who helps supply it. And in general we can give people a break. Let being gentle and compassionate be our default mode of interaction. Because everyone is struggling in their lives in different ways. Life is all too short and all too difficult - so at the very least let's not compound people's difficulty. It's like Yaakov Avinu describes his life: "short and bad". (Though that reminds me of the Woody Allen joke about the two elderly women in a Catskills restaurant. One says: "The food here is terrible." The other says: "I know, and such small portions.") But even though life is so hard, and even though we can't control whether it's going to be a "Book of Life" year for us and our loved ones, or not - every time we ease a person's suffering, every time we generate a little joy and uplift, connect with people, savor a breath of air, truly engage life - for that moment we've written ourselves into the Book of the Living. It's the one book we do have some control over. And it's the one that truly counts. So k'tiva v'chatima tova. May we write ourselves into the Book of the Living at every opportunity, and may we all enjoy a good and sweet year ahead.